Canberra is unlike any other capital city and you have to visit it to understand why. Our Canberra day tour will take you over the mountains into the Australian ‘bush’ and Australia’s sheep country. World class attractions, amazing architecture and futuristic planning all play their part in making Canberra one of the world’s most modern and progressive cities. Lunch is at your own expense and options are limited, we recommended that you pack your lunch with you. With so many things to see and do in Canberra, as well as the Highlights listed, we give you almost 2 hours free time to check out two other world class attractions. 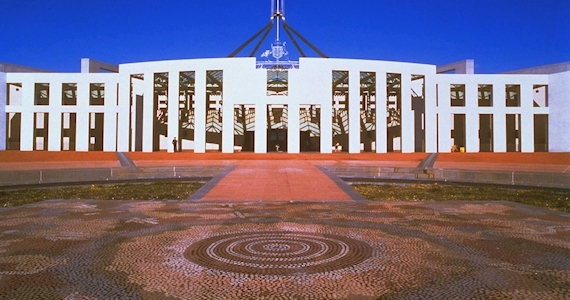 You’ll feel the might and privilege of our Australian democracy as our guide takes you through this architectural masterpiece costing $1.1 billion. From the inner halls of power to walking on the roof, this is an amazing building. Australian War Memorial A time of reflection as you discover the legends of Gallipoli, the ANZACs, the sacrifices and losses suffered by Australians in past wars fought around the world. National Museum of Australia Controversial and popular, Australia’s most modern museum has won national awards with its interactive mix of exhibits and displays highlighting Australia’s diverse history and culture. We’ll take you to Yarralumla, for a close look at many national embassies, each one unique and designed to reflect aspects of the country’s culture. Take in the impressive 360-degree views over the capital city and surrounding mountain ranges of Canberra. Captain Cook Memorial Jet See the spectacular 145 metre high spire of water soaring above Lake Burley Griffin. If you’re planning on going to Melbourne at some stage, then book this tour and choose the option of the awesome overnight Aussie Farmstay Adventure onto Melbourne.